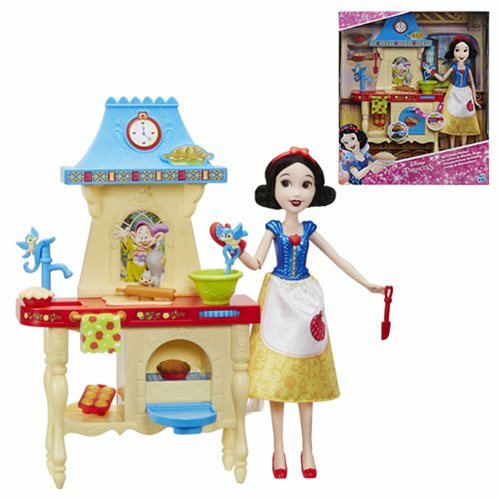 Join Snow White and her animal friends in pretending to make yummy treats! In the Stir 'n Bake Kitchen, girls can imagine Snow White is baking muffins and pies for the dwarfs. Attach the doll to the playset to keep her standing while playing. Roll the dial to activate Snow White's spoon stirring the batter and her squirrel friend rolling pretend dough. The oven has a rotating rack that flips so little dreamers can pretend Snow White's homemade apple pie is baking. Before playing with the set, girls place the cooked pie accessory in the oven and close the door. Then, when they're ready to pretend to bake with Snow White, they can place the uncooked pie accessory in the oven, close the door, and open again to see the baked pie. With the spatula, oven mitt, and muffin pan, girls can play out different and exciting cooking stories in the kitchen with this sweet and caring princess! Includes playset, doll, skirt, headband, 2 pies, muffin pan, oven mitt, towel, and spatula. Ages 3 and up.